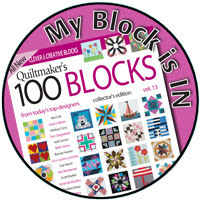 Thank you for visiting during Quiltmaker's blog tour! Check out the giveaway comments for lots of ideas on how quilters use these magazines for inspiration and quilting projects. The magazine should be available in your local stores now. Random Number Generator picked #37 - Congratulations Kathy! Kathy's comment: Cute block!! I like to use them as table toppers. I also drew a second winner from my newsletter subscribers! Congratulations to Joanne! Sign up for my newsletter for extra insights from me - and surprise chances to win too.